Did you know that sugars such as glucose are part of an “inflammatory diet” that can trigger rosacea flares and increase your rosacea symptoms? What is Glucose? Commonly called sugar, glucose comes the food you eat such as fruits and carbohydrates. Outside of fruit, bread, pasta, rice, potatoes, carrots, and beats are also common sources of glucose that are not as obvious. These foods are broken down into sugar in our stomachs and then absorbed into the bloodstream. This process is aided by our pancreas, which forms beta cells that create insulin that helps store and utilize glucose. Glucose is necessary for energy production in all cells throughout our body. But when the pancreas can’t keep up with the excess glucose, ( prolonged high glucose diets, or high sugar intake spikes), it can pair with free radicals becoming a toxic molecule that binds to the walls of your blood vessels like rust causing damage to your vascular system. In short, glucose levels that are either too high or too low cause vascular inflammation and damage contributing to a multitude of health issues including rosacea! While we are now seeing media and the medical community shifting from “controlling fats” to controlling high “sugar” or glucose in the prevention of heart and vascular disease, the focus of this article is to help rosacea sufferers understand how diets with excess sugar and carbohydrates are a big contributor to their “red faces”, flair ups and break outs. After all, rosacea is a vascular condition at its core. In fact, excess blood sugar levels (glucose) are one of the top inflammatory culprits that stimulate rosacea flares and even progression of the disorder…it adversely affects the physiology and function of most organs throughout the body, especially rosacea-affected facial skin. As such, intake of glucose, sugar, even carbohydrates which break down as sugars(glucose) in the blood stream must be balanced and controlled, as high blood sugar levels and spikes are at the very top of the list of inflammatory triggers for rosacea sufferers. Glucose is a strong blood vessel dilator that naturally causes flushing. Moreover, glucose is fast acting: within 20 minutes of drinking one can of soda, the inflammatory effects of glucose can reach the facial skin. Excess glucose can also cause substantial blood vessel damage by binding onto blood vessel cells and rendering them inactive or killing them. This adverse effect is called glycation and can lead to vascular hyper-reactivity and physical vascular damage. Oxidized glucose or Advanced Glycation End-Products (AGE’s) change the way the blood vessels function. If enough AGE’s build in the blood, they will cause the veins to rupture, resulting in the small, broken vessels that we see on the nose, chin and cheeks of rosacea sufferers. If left out of control and allowed to run rampant the build up of AGE’s chronic inflammation increases rosacea’s progression and its visible symptoms to increase. Glucose also causes red blood cells and platelets to become “sticky” and clump together in the blood stream. This directly affects the severity of rosacea because these large clumps of red blood cells can enlarge blood vessels, push them closer to the surface, and eventually cause vessels to rupture. In addition, sticky-clumped red blood cells increase the degree of facial redness because there is much more “red” flowing through superficial skin blood vessels under normal conditions and during flushing reactions. Excess glucose usually causes “visible” rosacea flares the same day or within 72 hours of consumption; however, glucose can also cause death to vascular cells and activate inflammatory enzymes in rosacea skin over many weeks or months with repeated insults — e.g. “invisible damage” and rosacea progression. The latter is hard to observe or test for… just know that it happens in all rosacea sufferers. Ask your physician for a “Glucose Tolerance Test” A Glucose Tolerance Test is an excellent test to help determine if glucose and sugars affect your rosacea quickly and to what extent. This will help you determine if facial redness or flushing that occurs during meals (especially in front of friends) is due to glucose. The Glucose Tolerance Test simply involves drinking a solution with 70 grams of glucose and then monitoring your response every 30 minutes for two hours. This monitoring involves not only visually inspecting changes in your rosacea, but also conducting blood tests to measure changes in your glucose and insulin levels (insulin is the hormone required to help glucose enter cells). Try a new diet that is low in glucose, sugar and carbs. This is not an easy task but a four week “low glycemic diet” (ie one without soda’s, snacks or foods high in glucose, sucrose, fructose or even “fake sugars” or processed, high card foods) should tell you how sugars like glucose affect your rosacea flares, triggers, symptoms and skin hyper-reactivity. A good percentage of rosacea sufferers will be astounded by the positive affect low-sugar diets have on their rosacea (not to mention their waistline!!). Just as important, this is one of the healthiest changes one can make for overall health as sugar consumption is linked to increased incidence of cardiovascular disease, heart disease, arteriosclerosis and neuro-degenerative disorders. Yes, t will take a little discipline, but you may be surprised at how your skin and body responds. 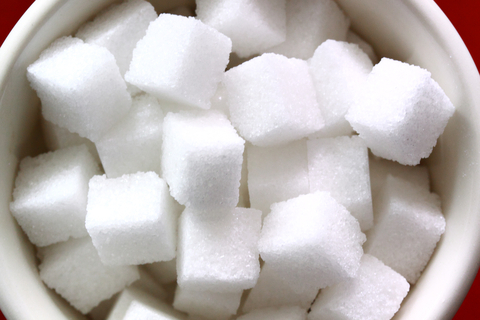 While going on a restricted sugar diet will reduce inflammation and rosacea symptoms for some, it is hard to totally abdicate from sugars and carbohydrates that we are used to eating on a daily basis. This is because many of us are not even aware of the amount of sugar we are ingesting due to hidden sugars in breads, rice, sauces and convenience and low fat foods. Moreover, its admittedly hard to monitor our carbohydrate intake and determine what each item’s “glucose” value is. For starters, its all about reading the labels and being conscious of what you are eating. Please read the actual ingredient list of the items you consume because the front of the package often includes terms that can be deceptive and “low fat”, “lean” and “high grain foods” can still be loaded with sugars and carbohydrates (that turn into sugars in the intestine). Also note, sometimes, you will even see various types of sugar listed on the label more than once! This means that there is most likely a alarming amount of sugar in the product. Dividing up sugars into various source types is a tactic manufacturers use to have the percentage of sugar in the product look smaller or not be at the top of the ingredient list! Knowing “sugars by a different name” ingredients, you can make informed choices in what you choose to buy and consume. To begin to control your sugar intake it is recommended that you consume less than 15 to 20 grams per sitting and less than 40 grams in a 24-hour period. Basically, women should limit their maximum “sugar intake” to 12 teaspoons daily, while men can ingest 16 teaspoons daily. To put these values in context, a single can of soda has over 11 teaspoons of sugar!!! Read the labels! Check grams of sugar, the serving size (in grams) and also look for hidden sugars, as many processed foods add sugar where you don’t expect it. For example, in many “Low Fat” foods, fats have been replaced with sugars for taste improvement. Keep a food journal: Keeping track of what you are consuming can not only help monitor your sugar intake, but also provide insights into what foods trigger your rosacea, enabling you to avoid them in the future. Don’t add sugar to your coffee or cereal. Keep in mind a teaspoon of sugar in your coffee is 5.3 grams and those grams add up quickly throughout the day. > Study the glycemic index. > Limit portions and eat high value carbohydrates throughout the day vs. large portions in a single sitting (leading to a glucose spike). > Avoid processed grains and foods such as white rice and flour. > Watch your starches: limit white potatoes, corn and other starchy foods. Instead, favor leafy greens and root vegi’s. Basically, eat high value carbohydrates that help to stabilize blood sugars and avoid low value simple carbohydrates to help avoid inflammatory reactions caused by excess glucose as well as help to avoid vascular damage. Instead of reaching for that soda, drink green or black tea flavored with half & half which has no sugars. Reach for gluten free or corn tortillas or wrap your nitrate and preservative free lunch meat in a lettuce leaf for a lower carbohydrate option. Need a snack? Reach for almonds, celery with hummus or sting cheese. Have a sweet tooth? Opt for fruit where your getting naturally derived sugars plus fiber which is good for you. But limit how much fruit you have through out the day as these are considered sugar too. What’s great is now with the abundance of health conscious eaters there are many yummy places to find low-sugar and low-carbohydrate foods, not to mention “low glycemic index” recipes and food charts and plans to help you make healthy choices. 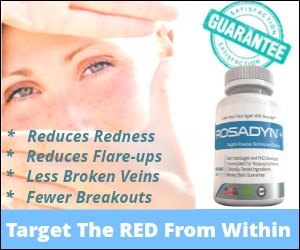 How Rosadyn can help you to reduce your absorption of sugars that cause your rosacea to flare up. Supplementing your meals with Nutraceuticals that are shown through multiple studies to reduce the absorption of glucose and/or prevent large glucose spikes during a meals can help you to take control of glucose-induced rosacea flare ups. Pine Bark Extract (95% OPC Eastern White Pine Bark Extract with Lecithin Phospholipids). Pine Bark Extract delays glucose absorption 190 times more effectively than prescription medications for glucose control according to a 2006 clinical study published in the Journal of Diabetes Research and Clinical Practice preventing the typical high-glucose peak in the blood stream after a meal. Astonishingly, the study revealed that pine bark is more potent for suppressing carbohydrate absorption in diabetes than synthetic prescription alpha-glucosidase inhibitors such as Precose. In two separate studies conducted in 2004, Pine Bark Extract was found to significantly lower blood sugar levels in type II diabetes patients. A study published in the March 2004 edition of Diabetes Care revealed that patients who supplemented with a proprietary form of Pine Bark Extract experienced lower blood sugar after meals and lower fasting blood sugar. Another study published in the October edition of Life Sciences revealed a significantly lowered blood glucose level in patients who supplemented with Pine bark Extract while continuing their anti-diabetic medication with acarbose and metformin. These studies show that clinical concentrations of Pharmaceutical-grade Pine Bark Extract can reduce absorption of glucose and resulting spikes that are primarily responsible for glucose-related facial redness and flushing. Chromate® (Glucose Tolerance Factor GTF). Chromate is a specialized form of chromium that has been shown to increase the uptake of glucose into cells. This, in turn, results in reduced levels of blood glucose and attenuates rosacea flushing. The normal dose is 200 to 600 mcgs per day and works synergistically with Rosadyn’s Pine Bark Extract. You can purchase this online at any vitamin store. Combining a healthy diet, (low glycemic index & anti-inflammatory) and adding in supplements that help to control glucose levels should help to reduce your facial flushing and help to prevent rosacea outbreaks (typically the following day) caused by spikes of blood sugars typically occurring after eating or drinking. Excess glucose, or glucose that remains in the blood for an unusually long time, will end up binding to cells within blood vessel walls and render them inactive or kill them. This is called glycation and is intimately involved in the progression of rosacea due to the physical damage it can cause. Glycation prevention (excess blood sugar) should be one of your top priorities and is one of the most important things you can do to maintain healthy, functional blood vessels and control rosacea flare-ups. Two Rosadyn ingredients can prevent and reverse glycation and should be incorporated into every rosacea diet. Sulforaphane. As of 2013, Sulforaphane is the single best Nutraceutical for blood vessel health and stability. In fact, there is no oral or topical prescription treatment that can protect and fix blood vessels like Sulforaphane. Sulforaphane, first discovered by researchers at John’s Hopkins School of Medicine, is now one of the top Nutraceuticals due to its ability to incorporate itself into cell membranes and protect against glucose-related damage and glycation, and is the only known substance to activate two key repair enzymes in damaged blood vessels. Rosadyn’s Sulforaphane is Pharmaceutical-grade quality and incorporated at clinical strength — two parameters that you rarely see in most Sulforaphane-based supplements. Benfotiamine. Benfotiamine is a fat-soluble form of vitamin B1 that is used to help control glucose-induced glycation. Used for decades in Europe as a prescription medication for Diabetes treatment, benfotiamine has become a critical nutrient for those seeking to ward off the potentially lethal impact of sustained high blood sugar levels. Benfotiamine acts through a novel mechanism, blocking the biochemical pathways by which high blood sugar damages cells throughout the body. Benfotiamine reduces elevated levels of intracellular glucose and alters the body’s biochemical response to the toxic breakdown products of excess sugar. Benfotiamine stimulates the production of transketolase, a naturally beneficial enzyme that efficiently converts these potentially toxic glucose breakdown products into harmless compounds that can be safely eliminated by the body. The standard dose is 150 mcgs one to two times daily. This supplement can be purchased over the internet at most vitamin-based web sites. Glucose also causes red blood cells and platelets to become “sticky” and clump together in the blood stream… an often overlooked side effect of excess glucose. This directly affects the severity of rosacea because these large clumps of red blood cells can enlarge blood vessels, push them closer to the surface, and eventually cause vessels to rupture. In addition, sticky-clumped red blood cells increase the degree of facial redness because there is much more “red” flowing through superficial skin blood vessels under normal conditions and during flushing reactions. Rosadyn’s proprietary Pine Bark Extract (95% OPC Eastern White Pine Bark Extract with Lecithin Phospholipids). In scientific and human clinical studies, Pine Bark Extract was shown to reduce platelet stickiness better than aspirin and low-dose prescription medications such as Warfarin. The other benefit to Pine Bark Extract is that it does not upset the stomach like aspirin can and it does not increase bleeding like aspirin and warfarin are known to do. Controlling glucose-induced “blood stickiness” will help to reduce the degree of superficial redness and also protect fragile blood vessels from breaking or clotting. Eating a healthy diet and supplementing with Rosadyn can help you, your rosacea and your vascular health. So, you can now see how glucose or your “blood sugar” levels over the course of the day and cumulatively over one’s life can impact your general health and vascular system condition. A diet high in sugars, processed foods, low value carbohydrates leads to increased progression of rosacea’s annoying symptoms. After all, the core component of rosacea is one’s vascular health and function. Improving the health of your vascular system will begin to reduce your rosacea flare ups, burning and help reverse life long damage, although this healing does not happen overnight…it took you a lifetime to get to where you are today. But it need not take a lifetime to improve. With conscious choices, time and persistence you can begin to heal and potentially reverse the damage caused by life long excesses of glucose. The benefit is not only a reduction of your rosacea, but also an improvement in your overall health.